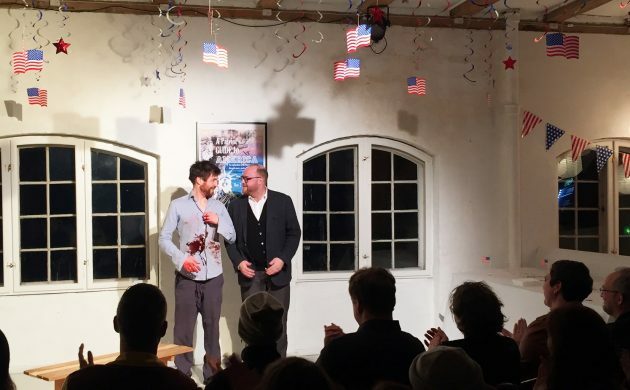 When there are two British actors posing as Americans in the heart of the Danish capital, the result is a brilliant depiction of ‘The Zoo Story’ at the House of International Theatre, a dream for the artistic mind complete with theatre, live music, and other forms of performance and visual arts. On a weekend in early November, this creative hub was blessed with the presence of well-established British performers Charlie Waller and Adrian Mackinder who gave a heart-warming (and wrenching) portrayal of Edward Albee’s one-act classic. The plot line of The Zoo Story is unique, dark, yet intensely relatable. Set in 1958 New York City, two strange men meet at a bench in a public park where one conversation will change their lives forever. These two strangers are the classic tropes of the businessman and the bum: the prime examples of who to be and who not to be. However, their verbal exchange reveals that both have their fair share of joys and sorrows, indicating that their lives are not so different after all. Albee creates a perfectly simple setting in which complicated issues such as fulfillment, isolation, miscommunication, identity, and class divisions can be addressed. The power of this play is heightened by the fact that there is no attempt to resolve these universal problems, only to discuss them. Waller and Mackinder could not have executed a better interpretation of this theatrical masterpiece. The shared performance felt so natural it was almost as if the audience were listening in on a conversation at the park as opposed to watching a staged drama. However, this authenticity did not soil the quality of the acting as every word and action was as emotional and intriguing as the last. This acting style fitted the story perfectly and enhanced its major theme of depicting the ‘real’ human experience. Even though this run of ‘The Zoo Story’ has come to a close, this memorable tale can still be experienced through its print and digital copies. Pick one up and be immersed in a brief story that will prompt thought and feelings.